Impossible for the managers to get a cellular signal inside a rural beverage manufacturing plant. Cel-Fi QUATRA improved coverage in the large, high ceiling plant. 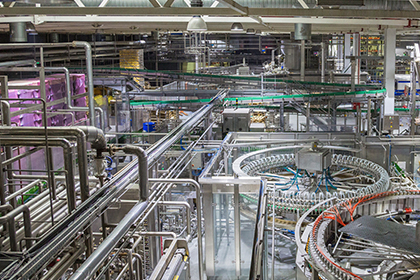 A large beverage manufacturer with a 376,000 sq. ft. plant decided to do away with landlines, opting instead to give cell phones to its 40 managers. However, its rural location coupled with the plant’s metal roof made it nearly impossible for the managers to get a cellular signal on their phones when inside the building. To solve this challenge, KonectaUSA installed Cel-Fi QUATRA, an active DAS hybrid designed to bridge the price-performance gap for the middleprise. KonectaUSA chose QUATRA because, unlike analog boosters and passive DAS technology, it delivers a cellular signal that is up to 1000x stronger, utilizing CAT 5e cabling and Power over Ethernet, with no signal attenuation right to the perimeter of a building. The scalable solution also includes proprietary intelligent tools that provided KonectaUSA with greater flexibility and ease in optimizing the system design for this unique environment. “A system design can look okay on paper, but sometimes engineering on the fly is needed because of the wireless environment that is created by the carriers” explains Bozyk. Initially KonectaUSA planned to put Cel-Fi MIMO Panel Antennas on the back of the building, pointing across the entire metal roof, but the metal was creating havoc with the signal. According to Dave Schlange, co-founder of KonectaUSA, “We used the Cel-Fi WAVE cloud-based management platform to see the readings from the signal. We were able to determine the signal quality and strength from the antennas on front of the building were substantially better than the antennas we had mounted on the back.” So KonectaUSA moved the antennas into a new position at the front of the building and was able to get a signal into the plant from a nearby carrier tower. In keeping with its recipe for successes to date, KonectaUSA has since gone on to outfit two additional plants for the beverage company—both with Cel-Fi QUATRA. KonectaUSA expects that it will see a significant surge in its middleprise business thanks to the solution— and to the company’s unwavering commitment to doing quality work.